TANDEM III - by Anthem Properties. 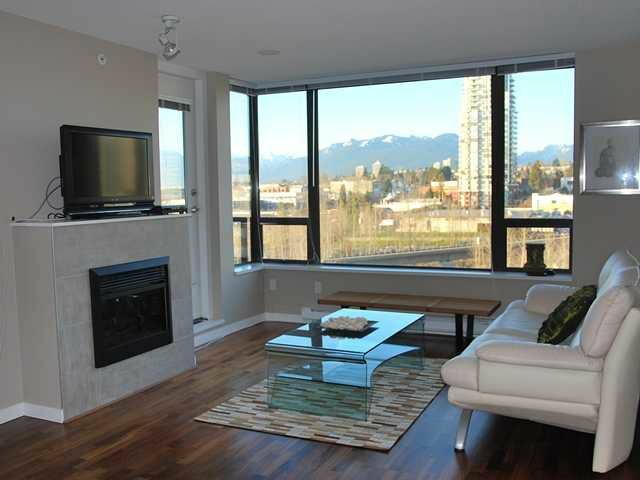 As you enter the suite you'll be struck by the fantastic view of the North Shore Mountains. This spacious 1-bedroom suite is in excellent condition and FEATURES a nice-sized balcony, engineered hardwood floors, stainless steel appliances, granite countertop, fireplace plus a computer work-station with shelves. Leave your car at home in this up-and-coming neighbourhood - you're just a short walk to the Gilmore SkyTrain, Home Depot, Save-On Foods and Brentwood Mall. AMENITIES include hot-tub, sauna, steam room, fitness centre, party room and a garden terrace. This suite comes with 1 parking & storage. Pets & rentals are OK. BONUS: the building has 5 years on 2-5-10-Warranty. PUBLIC OPEN: Saturday January 28th, 2-4 PM.